This post is sponsored by National Hardware. 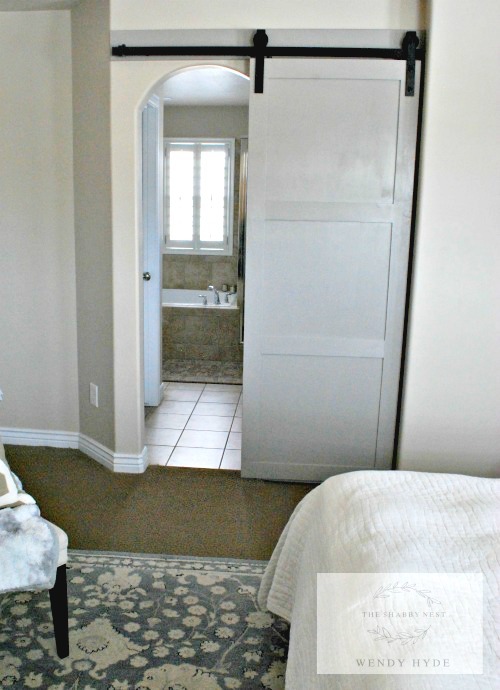 Okay, so I know that it is really popular in newer homes to have the master bath open to the master bedroom. What I don't understand is "WHY?" 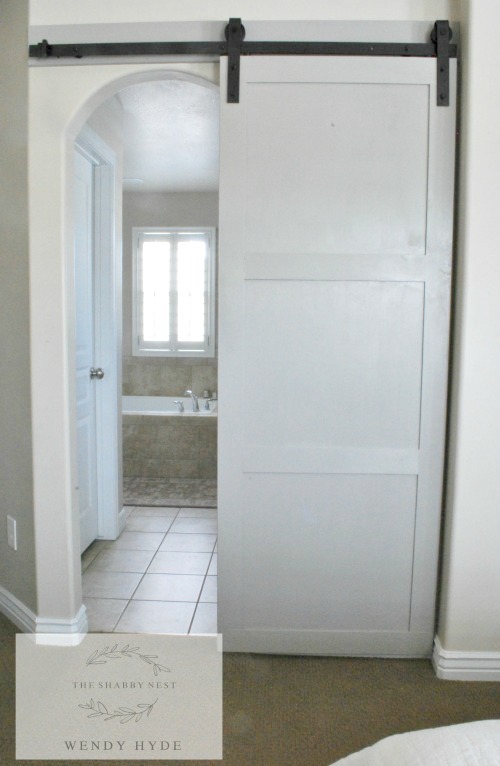 I don't know about you, but honestly, I prefer to have a bathroom to which I can shut the door. Ever since I moved into Hydeaway Cottage, the fact that I have an open master bath door has plagued me. Not only that, but the opening to my master bath is an arch, so it's not like I could just run to the hardware store and buy a door to put there. 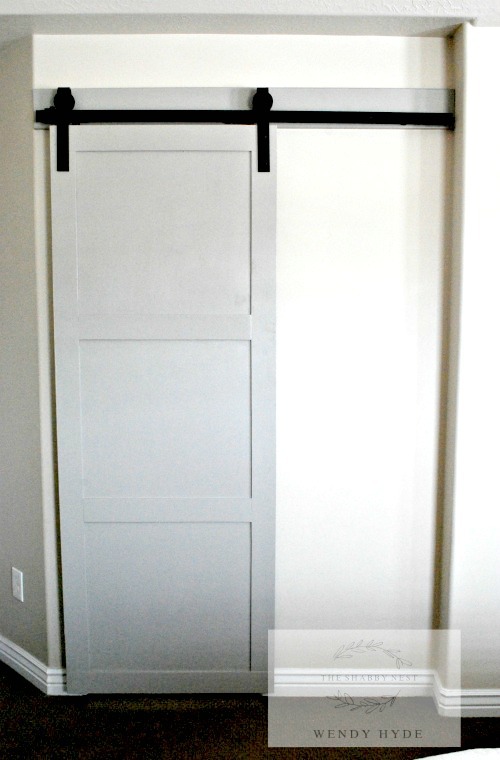 After I gave the idea some thought, I decided that a barn door would be the perfect solution. 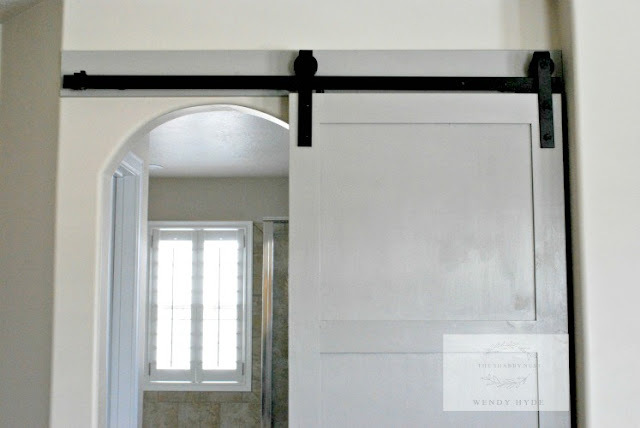 I could custom make a door that would fit the tall arched opening, and the barn door hardware would make it so that the door could be rectangle and slide right over the opening. Brilliant! I kept my eye out for some barn door hardware. But I was having a hard time because the wall with the door is not very long - only about 58". Luckily, I was approached by National Hardware to see if I would like to try out their barn door hardware. The shortest length they had was 72", so before I could agree, I needed to be sure that cutting down the hardware would not interfere with its functionality. I was assured that it would still work. So I went ahead and chose some pretty black iron hardware. Once it arrived, my father helped me to cut it down. (We did have to re-drill some of the holes as well). Then he built me this gorgeous three paneled door which I painted Sherwin William's Dorian Gray. Some handy friends helped me install the door, and now I have a lovely barn door, and just as importantly, I have privacy! It didn't take long to install - less than an hour. And the track works beautifully. The door slides smoothly and quietly, and bumpers on either side of the track keep it from moving too far. A brilliant solution and a handsome addition to my master suite. Love it! I was given complimentary product from National Hardware in exchange for my review. As always, the opinions expressed are 100% mine. What a perfect solution for this space! I would hate not having a bathroom door too!! :) I love how it turned out. I have the exact same issue in my master bedroom. What an awesome idea that I think I will borrow.